The snow is gone here in western Maine! It won't be long now until we're breaking out the shorts, tee shirts, and flip flops. As the summer gets closer the Practical Ed Tech Summer Camp is filling up. As of this morning there are only six seats remaining for this hands-on learning experience. If you have been thinking about registering, now is the time. 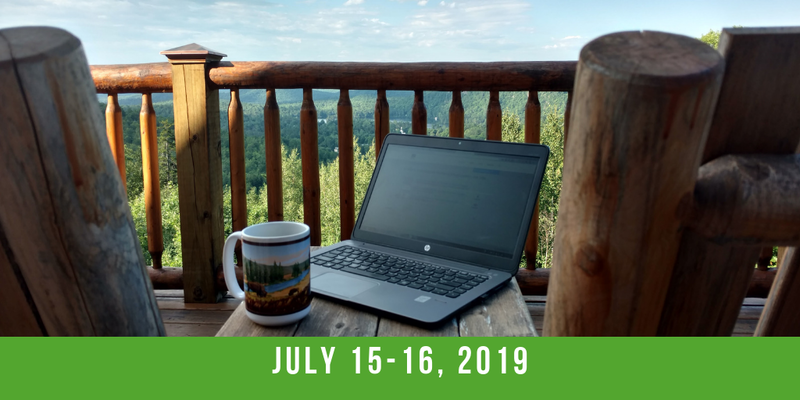 In the following video I answer a bunch of FAQs about the 2019 Practical Ed Tech Summer Camp. Check out this list of things to learn and do at the Practical Ed Tech Summer Camp. Creating a mobile app can be a great way to get students interested in learning programming concepts and to get them to dive into researching a topic so that they can build the best apps they can. For example, if a student wanted to create an app that serves as a fun review game, he or she would need to have a solid knowledge of the topic in order to create a meaningful app. 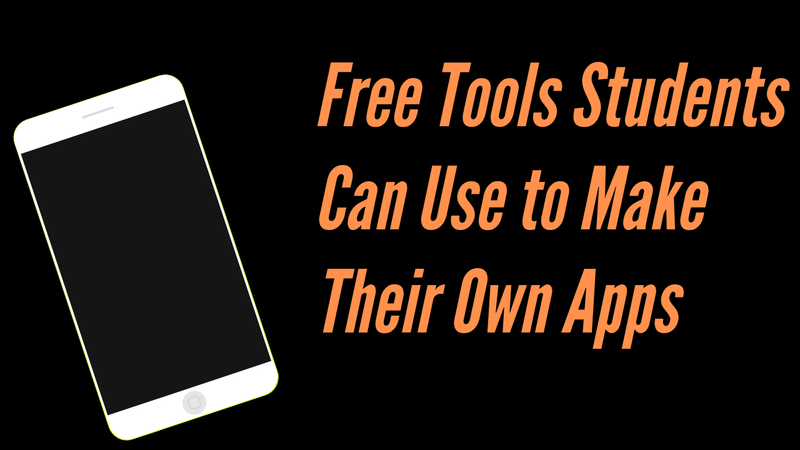 To that end, here are four free tools that students can use to develop their own mobile apps. The MIT App Inventor is a great tool for developing an Android app. The MIT App Inventor works in your web browser (Chrome is recommended). The only download that is required for App Inventor 2 is the optional emulator. The emulator allows people who don't have Android devices to test their apps on their desktops. If you have an Android device then the emulator is not required and you don't need to worry about installing it. MIT provides excellent support documentation and curriculum for classroom use for new users of App Inventor. Tutorials are available as videos and as written PDFs. A couple of the videos are embedded below. If you want to create an iOS app, Thunkable provides a way to do that in a manner that is very similar to that of the MIT App Inventor. In fact, Thunkable is based on the MIT App Inventor framework of using jigsaw-like pieces that have commands labeled on them. Your job is to put the pieces together to make your apps work. Thunkable offers detailed written tutorials and video tutorials. A playlist of tutorials for beginning app designers is embedded below. Metaverse Studio is a free service for creating your own augmented reality learning experiences. With Metaverse you can create interactive, augmented reality games and challenges for students to complete on their phones or tablets. Metaverse Studio is a block programming (sometimes called visual programming) interface similar in concept to what you will find in the MIT App Inventor and Thunkable. This means that you don't write code. Instead of writing code you create your augmented reality experience by selecting commands and selecting pieces of media from a menu. Put the commands together in the proper sequence and your augmented reality experience can be used on any iOS or Android device. At first glance the Metaverse Studio might look a little intimidating, but after a couple of tries it becomes rather intuitive. It also helps that Metaverse has recently launched a new set of clear video tutorials. The first of those can be seen here. I've written a lot about Glide in the last couple of weeks because I think it's amazing and many readers have reached out to me to share how excited they are about it too. Glide enables anyone who can make a spreadsheet in Google Sheets to create his or her own mobile app. If that sounds simple, that's because it is just that simple. Here's my video about how to use it. And here's a list of ways you might use it in your school. 1. Create a mobile study guide: This was the first thing that I thought of when I discovered Glide. 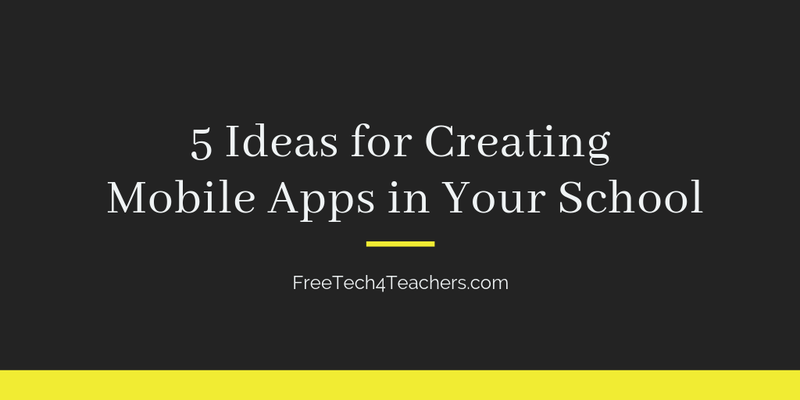 You or your students could create an app that lists each section or unit of your curriculum. In each section you can provide videos, podcasts, or simply link to additional documents for review. 2. Create a mobile version of school handbooks: When parents have a question about your school, their first instinct is probably to pick up their phones to search your school's website or to call the office. A mobile version of your school's handbook could make it easy for parents to quickly find the answers to frequently asked questions. 3. Create a guide to your community: Are you looking for a community service project for your middle school or high school students? If so, consider having them develop a guide to the highlights your community. 4. Develop a mobile reporting system: Do you have students or parents using Google Forms for logging information about multiple goals like independent reading, outdoor play, or behavior goals? If so, consider placing links to all of those forms in one convenient app. You'd do this by placing the links to your Forms in the columns in your spreadsheet before publishing it through Glide. 5. Room Use Schedule: For many years I worked in a school that had more teachers than classrooms so it was always kind of a guessing game as to who was using which room when. Having an app that made it easy to find out who was using which rooms at which times would have been amazing! With Glide you could create that kind of app. Glide is one of the free tools that we'll explore in depth during the Practical Ed Tech Summer Camp. I would love to have you join us. Six seats are left! Register here! Over the last ten years the most common reason that people give me for unsubscribing to the blog is "too many updates." That is why five years ago I started the Practical Ed Tech Newsletter. This is a newsletter that I send out once a week on Sunday evenings. In the newsletter I share my tip of the week and a list of the most popular posts of the week from Free Technology for Teachers. 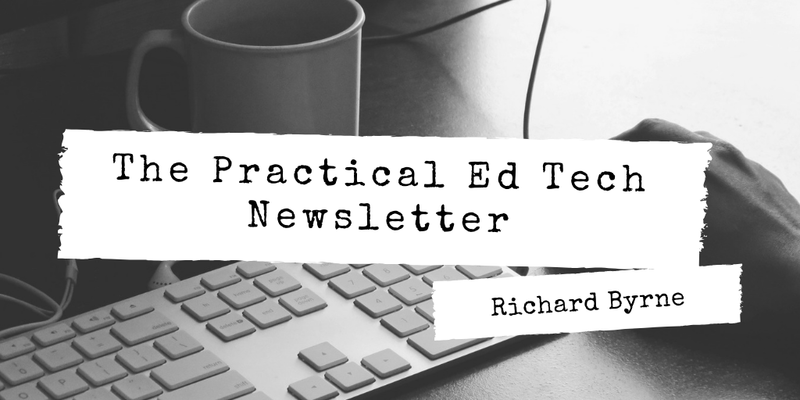 As of this evening 17,129 people are subscribed to the Practical Ed Tech Newsletter. You can join them by signing up here. If you are currently receiving the daily emails from Free Technology for Teachers and you register for the Practical Ed Tech Newsletter, you won't be unsubscribed from the daily email list unless you click the unsubscribe link that is in the footer of the daily email. Flipgrid is a free video response service that has become massively popular in the last couple of years. Everywhere that I go, including today's visit to Bonner Springs, Kansas, teachers are using Flipgrid to collect students' video responses to all kinds of prompts. 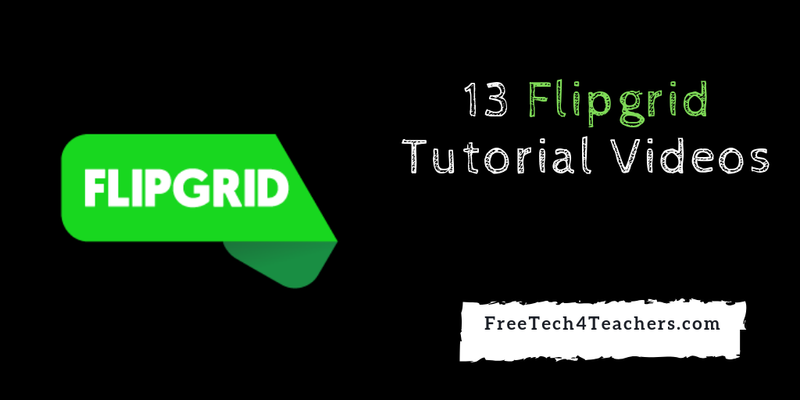 If you haven't tried Flipgrid, I have thirteen tutorial videos that will walk you through everything you need to know to get started. I recommend starting with this one. If you're trying to get your colleagues on board with Flipgrid, feel free to share this playlist of tutorials.